Scrubbing our businesses and investments for the decade ahead. See how the Florida Scrub Jay sent an investing and business message to Merri and me. Yesterday’s message looked at the problem of “Layered Debt Concerns” and how this has led us to expand our business. The Florida Scrub Jay is the only species of bird endemic to the State of Florida and is found only in Florida scrub habitat, an ecosystem found only in central Florida characterized by nutrient-poor soil, occasional drought and frequent wildfires. This species is listed as a endangered federal species by the United States Fish and Wildlife Service. Investors and businesses need to clean out old ideas and prepare for the way things will be in times ahead. This quest sent Merri and me to the Scrub Jay Trail. Here is what happened. Merri and I are fixer uppers. As outlined in a recent article on investing in value real estate,,, for the past 30 years we have always had some fixer upper real estate project in the works. Times change. In the past…. our fixing up would have included creating a really nice lawn. We are eliminating grass and turning the yard into a native species showcase instead. Yards in Central Florida require a lot of care and too much water... that could be used in better ways. Changes in energy consumption and environmental impacts are beginning to alter the value of property in different ways. High energy and water consumptive properties lose value. A decade ago a big… green lawn was a selling point. Now alternate energy and low water and efficient energy use is what sells. Plus who wants to mow four acres! So we asked our son… an trainee attorney focused on environmentalism but with training and a life long love as a landscape architect. He has years of work with the National Wildlife Federation including a specialty in backyard habitats. We of course asked him for help and ideas when he was with us for the holidays. These events led us to the Scrub Jay Trail and highlighted a problem. If you have been reading this site for long you know… problems create opportunity so let’s look at this problem of environmental change. An excerpt from December 21, 2010 New york Times article entitled “TEMPERATURE RISING A Scientist, His Work and a Climate Reckoning” defines the problem when it says: MAUNA LOA OBSERVATORY, Hawaii — Two gray machines sit inside a pair of utilitarian buildings here, sniffing the fresh breezes that blow across thousands of miles of ocean. They make no noise. But once an hour, they spit out a number, and for decades, it has been rising relentlessly. The first machine of this type was installed on Mauna Loa in the 1950s at the behest of Charles David Keeling, a scientist from San Diego. When Dr. Keeling, as a young researcher, became the first person in the world to develop an accurate technique for measuring carbon dioxide in the air, the amount he discovered was 310 parts per million. By 2005, the year he died, the number had risen to 380 parts per million. Sometime in the next few years it is expected to pass 400. Without stronger action to limit emissions, the number could pass 560 before the end of the century, double what it was before the Industrial Revolution. The greatest question in climate science is: What will that do to the temperature of the earth? Scientists have long known that carbon dioxide traps heat at the surface of the planet. They cite growing evidence that the inexorable rise of the gas is altering the climate in ways that threaten human welfare. Fossil fuel emissions, they say, are like a runaway train, hurtling the world’s citizens toward a stone wall — a carbon dioxide level that, over time, will cause profound changes. The risks include melting ice sheets, rising seas, more droughts and heat waves, more flash floods, worse storms, extinction of many plants and animals, depletion of sea life and — perhaps most important — difficulty in producing an adequate supply of food. Many of these changes are taking place at a modest level already, the scientists say, but are expected to intensify. Many countries are reluctant to commit themselves to tough emission limits, fearing that doing so will hurt economic growth. Challengers have mounted a vigorous assault on the science of climate change. Polls indicate that the public has grown more doubtful about that science. Some of the Republicans who will take control of the House of Representatives in January have promised to subject climate researchers to a season of new scrutiny. But most scientists trained in the physics of the atmosphere have a different reaction to the increase. As the political debate drags on, the mute gray boxes atop Mauna Loa keep spitting out their numbers, providing a reality check: not only is the carbon dioxide level rising relentlessly, but the pace of that rise is accelerating over time. Climate change. That’s the problem. Plenty argue if it’s good or bad and if bad how serious. Yet one fact seems quite certain… there will be change and a unified global climate reform will be slow. Here is the Climate Crunch. The World Bank considers a country with an average income of $12,196 of purchasing power per capita to be a high income country. The population of the 69 countries in this category are only a fraction of the total global population. The World Bank categorizes 213 economies and according to the 2009 GNI per capita, calculated using the World Bank Atlas method, the groups are: low income, $995 or less; lower middle income, $996 – $3,945; upper middle income, $3,946 – $12,195; and high income, $12,196 or more. This leaves 144 countries with about six billion people who want to have a high income as well. These countries are more concerned about creating more and better paying jobs than the environment. The 2007-2008 recession entrenched the problem because now many high income countries have a shifting concern for job creation and away from environmentalism as well. This means that many economic forces are currently ignoring the environment. However the longer this ignorance exists… the stronger will be nature’s warning call. Eventually green investing will be on everyone’s mind. Such thinking led to a partnership between our site and Jyske Bank in the early 2000s creating and tracking a green portfolio. My belief was that enough people were concerned about helping the environment that they would do something about it. That thinking already really paid off. Investments in that portfolio which consisted of wind energy, water purification and solar power companies rose over 250% in 2006-7. (However, the portfolio was not immune to the recession and suffered greatly in 2007-8.) The forces above have kept it stalled but there are many ways to invest in the environment now. Today there are numerous ETFs that allow investors to easily make green investments. Here are 14 examples. This does not mean that green investments will always produce the highest returns. 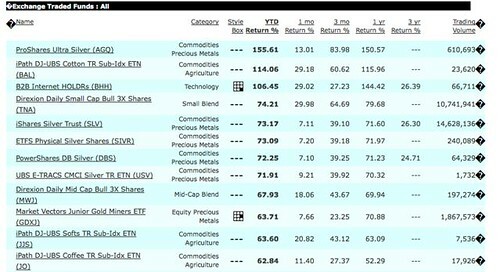 The chart below of the top dozen ETFs in 2010 shows that Consumption (commodities) and Hoarding (silver) were jumped on by investors in 2010. It is certainly not wise to speculate in investments just because they are green. However we can expect commodity bubbles probably in 2011 so green may be next! Just remember many green technologies are not proven so invest in green using your usual common sense, good value analysis and care. Having your own Green Micro business is one great way to turn your passion into profit. A perfect example is of Bruce and Cathy Brown who created the Scrub Jay Trail. Here are some details from this couple who gave up a film producing career at Disney Studios in Orlando to follow their love of wildlife. Here is an excerpt from their website. What started as a curious find near their native plant nursery blossomed into a natural attraction unlike any other in Central Florida. 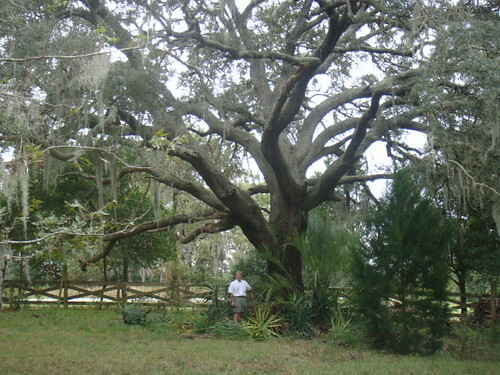 The tandem of former television executives, Bruce and Cathy Brown, started their new business in the countryside of Clermont, Fla., helping customers build unique landscaping plans with bird sanctuaries and butterfly gardens. In the spring of 1997, a small family of Florida scrub-jays caught their attention. The Florida Scrub-jay, the only species of bird endemic to the state, is limited to a number of small areas that have dry, sandy soil with oak scrub trees. The unique, inquisitive and intelligent species are friendly birds that mate for life and live in multigenerational families. “We started studying their habitat and we realized they were moving from one place to another,” Cathy said. To help attract and protect the threatened species, the Browns opened The Florida Scrub-Jay Trail in Clermont, Fla., in April 2003 with a grant from the National Wildlife Federation. 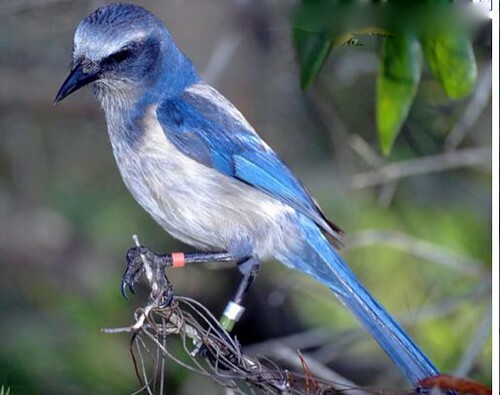 Visitors can experience The Florida Scrub-Jay Trail every weekend from 8 a.m. to 5 p.m. On the first Saturday of the month there is an orientation from 8 a.m. to 11 a.m. giving an in depth look at the Florida scrub-jay and its habitat. On the fourth Saturday of each month, from 8 a.m. to 11 a.m., volunteers and visitors, who are referred to as “trailblazers,” work to improve the habitat. “We’ve taken what was a fallow orange grove and turned it into a scrub habitat,” Bruce said. 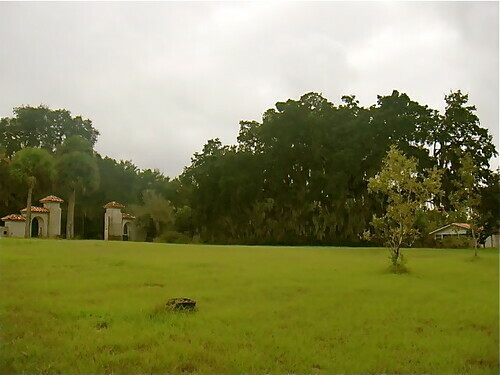 The Florida Scrub-Jay Trail is located at 11490 Monte Vista Road, Clermont, Florida. The Browns are also seeking volunteers to help at the farm and always love visitors when they are open. For more information, call (352) 429-5566, e-mail info@scrubjaytrail.org or log on to their Scrub Jay Website. This millennium has already created some of the greatest wealth ever… yet has also thrown many some economic curves. What the rest of the 2010s will bring we do not know. Yet nature gives us many clues that the environment is broken so we can be sure that great opportunity exists in getting it fixed. Never before will change take place as quickly. This is a huge opportunity for those who scrub the old investing and business ideas out of their thought patterns and prepare for new ideas and new ways of living, investing and doing business that are not just coming… but are already here. Learn how to use FM Plus (Frequency Modulation) to think out of the box when investing and in business at our February 11 – 12 2011 International Investing International Business Seminar or both – (saves up to $499) in Mt. Dora, Florida or both. and February 12-13, 2011.